I have heard this often over the years with the mothers I worked with, “Nicole I don’t have time to exercise or have quiet time for me.” Whether your daughter (or son) is one week old or in their 20’s and living at home, you have to take time for you. It is not being selfish when you do self-care. When you are overwhelmed, exhausted or just plain tired, you do not have any energy to be fully present with your child(ren) and/or partner. When you are exhausted and don’t give yourself permission to rest or go have some fun, you are more irritable with others and then will feel bad about yourself because you yelled at your child or partner. It is also role modeling to your daughter or son that you are more than a mom. I invite you to chose at least one of these tips and do it today. Sure, it’s easier said than done — but it’s not impossible. Even small chunks of ‘me’ time can help you recharge. Take advantage of naptime to put the baby in a stroller and enjoy a walk. Relax with a cup of coffee while the kids are absorbed in coloring. Read a book chapter, before you turn off the lights. If nothing else fits into your crazy schedule, step into the next room and take a few deep breaths. If you need to take some time for yourself, don’t be afraid to leave the kids with your spouse or a sitter for a while. This can give you the time you need to run errands or pamper yourself with a manicure, a massage, or even just a haircut. Whether it’s making time for a date night or just slipping a short love note into your partner’s pocket, rekindling romance can be a great reminder that motherhood is only one of your many roles in life. Find a few minutes to call or text a friend who knew you before you became a mother. If you had a hobby, keep your hand in it. If not, find something you enjoy doing, if only for a few minutes a day. When you’re with the kids, it’s OK to include activities you enjoy, like crafts, reading, being outdoors or going for ice cream. Journaling can help you stay in touch with your feelings, hopes, and dreams. 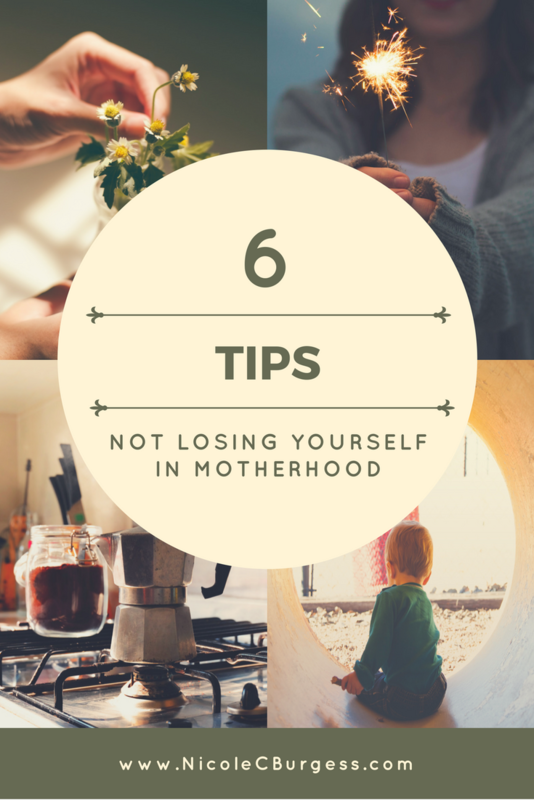 If you feel like you’re losing your identity, ask yourself whether some of your beliefs and expectations about motherhood might be standing in the way of who you want to be, and what you want from life.